A stay at Steigenberger Cecil Alexandria Hotel places you in the heart of Alexandria, within a 5-minute drive of Unknown Soldier and Abul-Abbas Mosque. This 4-star hotel is 10.7 mi (17.3 km) from Montazah Palace and 0.7 mi (1.1 km) from Manshia Square. With a stay at Royal Crown Alexandria in Alexandria (Sidi Jabir), you'll be a 4-minute drive from Mamoura Beach and 5 minutes from Stanley Bridge. This hotel is 7.2 mi (11.7 km) from Montazah Palace and 2 mi (3.2 km) from Stanli Beach. Semiramis is a beachfront hotel located in downtown Alexandria. It offers a restaurant and free Wi-Fi in public areas. Alexandria Zoo is 4 km away. Rooms here will provide you with a flat-screen TV, air conditioning and a minibar. Featuring a shower, private bathrooms also come with a bath. Some rooms have a balcony and a sea view. At Semiramis Hotel you will find a 24-hour front desk. The property offers free parking. The hotel is 1.1 km from Alexandrina Library, 1.7 km from Catacombs of Kom el Shoqafa and 8 km from San Stefano Mall. Borg el Arab International Airport is 37 km away. A stay at Aifu Resort places you in the heart of Alexandria, within a 15-minute walk of Montazah Palace and Montazah Beach. This hotel is 5.4 mi (8.6 km) from Royal Jewellery Museum and 5.8 mi (9.3 km) from Stanley Bridge. Al Maghraby is situated 250 metres from both the Mediterranean Sea and Tahir Square in Alexandria’s historic Mansheya district. It offers air-conditioned rooms with a satellite TV, a restaurant and a 24-hour front desk. All rooms feature a small seating area, dark wooden furniture and a small fridge. Most of the rooms at Al Maghraby Hotel have a balcony. There are many restaurants, cafés and bakeries surrounding the hotel or along the waterfront. Citadel of Qaitbay is a 5-minute drive away and Alexandria International Airport is a 25 minutes’ by car. Make yourself at home in one of the 90 guestrooms featuring refrigerators and LCD televisions. Rooms have private balconies. Satellite television is provided for your entertainment. Bathrooms with shower/tub combinations are provided. 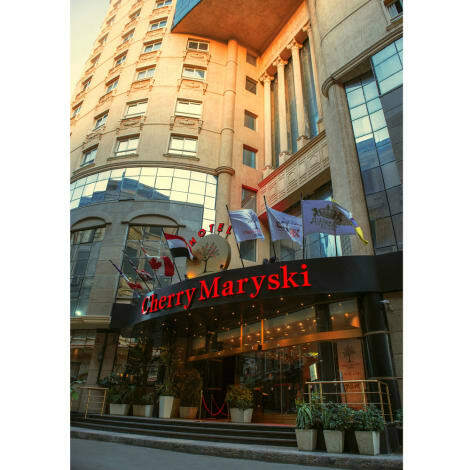 With a stay at Cherry Maryski Hotel, you'll be centrally located in Alexandria, just a 4-minute walk from Unknown Soldier and 5 minutes by foot from Manshia Square. This 4-star hotel is 10.4 mi (16.7 km) from Montazah Palace and 0.6 mi (1 km) from Attarine Mosque. Discover the beauty of Alexandria and enjoy stunning views of the Mediterranean Sea when you stay at the luxurious Hilton Alexandria Corniche hotel. Boasting an ideal location in the heart of Alexandria, this stylish hotel features its own private beach and an exclusive wellness facility. Marvel at exhibits in Alexandria’s impressive museums, shop in one of the nearby malls, traditional souks or simply relax and enjoy glorious sea views from the panoramic pool terrace.Relax in a spacious guest room or suite at this beautiful Alexandria hotel, all of which feature a sumptuous king-sized bed, a mini-bar and HDTV. For the ultimate indulgence, upgrade to a luxury guest room or suite on the Garden Floor, offering splendid sea and garden views.Enjoy breakfast as you look out over the sea in Brasserie La Corniche, savor authentic Lebanese dishes in the elegant Sahar El-Laialy and enjoy cocktails, fusion cuisine and the latest music in our chic nightclub, Club 35. Swim in the sparkling waters of the panoramic pool or take the complimentary shuttle to the hotel’s private beach. Work out in the 24-hour fitness center or pamper yourself in the wellness facility with a revitalizing treatment. Host a conference or celebration in Alexandria, with 11 modern meeting spaces available, covering an impressive 1,700sqm, including the grand Qait Bay Ballroom. We also offer a 24-hour business center and a dedicated staff and catering team, who will be delighted to help plan your event. Grab dinner at LE CLOVIS, a restaurant that specializes in French cuisine. Dining is also available at the coffee shop/café, and 24-hour room service is provided. Need to unwind? Take a break with a tasty beverage at one of the 2 bars/lounges. A complimentary buffet breakfast is included. lastminute.com has a fantastic range of hotels in Alexandria, with everything from cheap hotels to luxurious five star accommodation available. We like to live up to our last minute name so remember you can book any one of our excellent Alexandria hotels up until midnight and stay the same night.